If you live in Charleston, I basically have major [blog] envy. There are SO MANY gorgeous places to take photos! 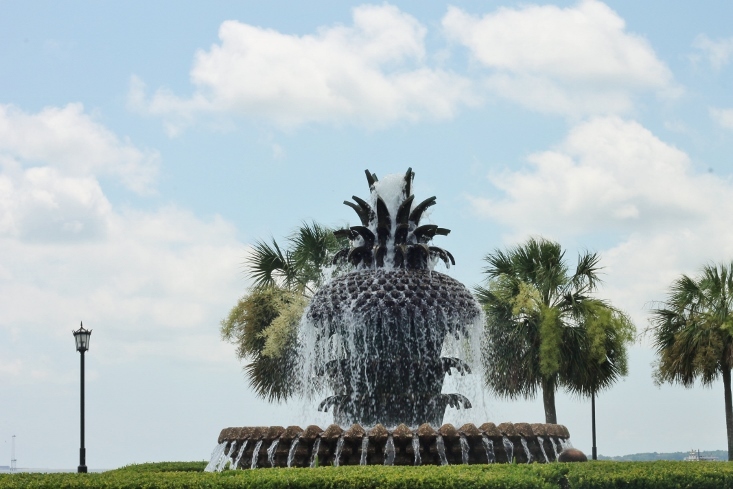 We walked around Sunday afternoon before heading home from SBScon and I fell in love with Waterfront Park (aka the Pineapple Fountain). Just freaking gorgeous! Thankfully, Lindsay was with me and snapped some photos underneath these bowing trees. Also I have lemons on my jeans and clearly, I couldn't let this outfit pass by the blog! There's something just so comforting about jeans and a tee, right? 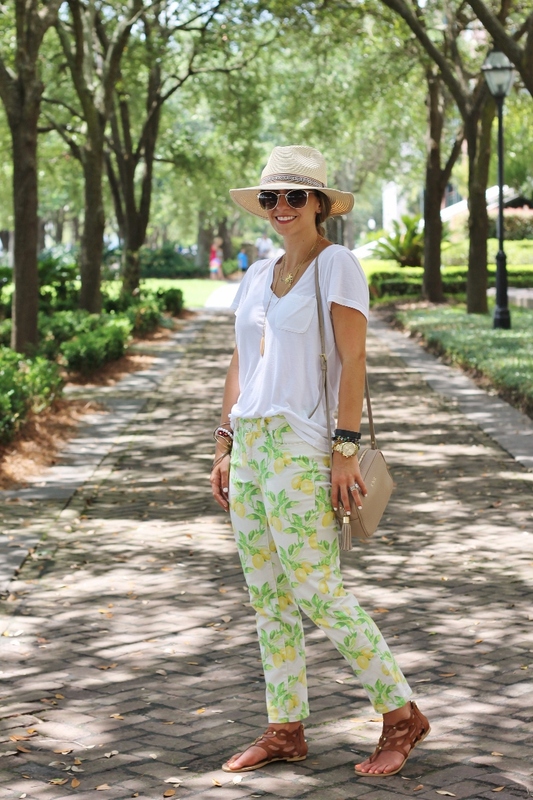 Thankfully these lemon print jeans (from Talbot's!) totally step up my comfy and casual outfit game. Not only do they fit so well (and I still ate lots and lots of brunch in them) but they are just the cutest. They also come in every size from 0 to 24, which makes them perfect for every gal! Shop these and more Talbot's lemon styles below. I still feel like I'm going through Charleston withdrawals. Getting back to my regular 9-5 work has been a bit tough. It was just so lovely to be around ladies (and 1 guy!) who totally understand this little blogging world. I'm so thankful for all the new #IRL friendships I formed! Oh and did I mention taking outfit photos was a breeze (thanks Linds!) I can't wait to share more details with you! Adorable! Love this fun print! Your pants are TOO cute! I believe lemons, pineapples, and flamingos SCREAM summer and you pulled this look off really well! Those pants are perfect! Looking cute. I saw these pants and wish I picked them up. You look great. These pants are so great!! Just adorable. Great look overall! 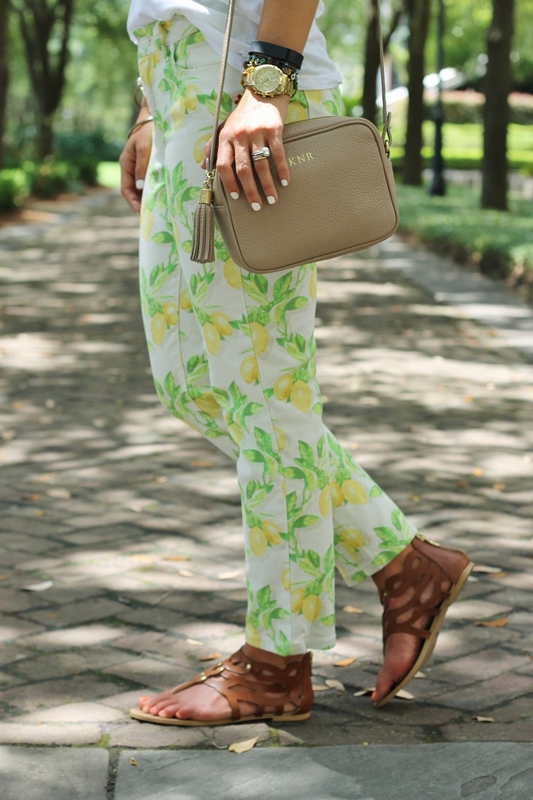 In huge love with those pretty lemon pants. You styled them perfectly for Summer with the plain white tee, Panama Hat and sandals. Love all your jewelry, especially the necklaces. The bracelets add to the Summer vibe also. Such a cute outfit! Love your soft white tee and hat! Those jeans are ADORABLE!! They SCREAM LILLY!! I see that they are in fact not though!! I love them. I love the print on these jeans! How cute are you?! LOVE these pants! so beautiful outfit! looks super fresh! Beautiufl background, love it there, and I really love the print, just perfect for summer! Great summery look! Those jeans look so cool!